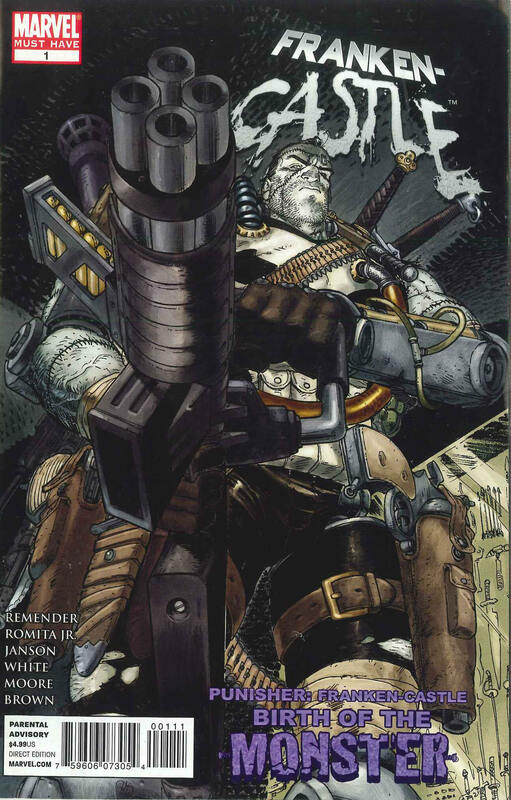 Collects Punisher Franken-Castle: Birth of the Monster (2010) and Punisher (2009 8th Series) #11. Its the 2-part tale that changed everything. First, Frank Castle has disabled much of Norman Osborn’s criminal underground, tarnished his well-groomed public image and attempted to assassinate him. Today Osborn returns the favor. Osborn dedicates himself and every single HAMMER resource to one goal: killing The Punisher. To make sure they don’t fail, The Dark Avengers are going with them. Somebody has to die. Somebody does. Then, in the belly of New York, skulking and forgotten creatures of the night uncover the remains of a man in a familiar outfit. Frank Castle is dead. What exactly IS Frankencastle?